Blurb: Cupcakes, crafting and love at The Cherry Tree Cafe... Lizzie Dixon's life feels as though it's fallen apart. Instead of the marriage proposal she was hoping for from her boyfriend, she is unceremoniously dumped, and her job is about to go the same way. So, there's only one option: to go back home to the village she grew up in and to try to start again. 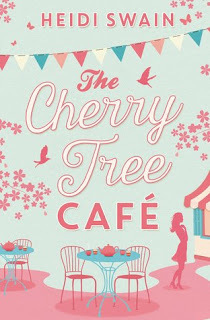 Review: When I first read The Cherry Tree Cafe's blurb, I knew it was my kind of read. I love baking and crafting so the promise of both mixed with a bit of romance is my idea of a perfect story. And after finishing it I can tell you that I was not wrong. As soon as I stepped into The Cherry Tree Cafe I felt like home. Even if when we first read about it, it still needs a bit of work, I completely fell in love with it through Lizzie's eyes. Actually, Lizzie's ideas and concepts to renovate it were some of my favourite bits of the story. But story behind this book is so much more than the renovation of the little Cafe. When we meet Lizzie, she is expecting a proposal from her rich boyfriend. Which doesn't happen, at all. Instead she is bumped and given that she moved to London for him and got her job thanks to him, she finds herself in quite an awkward situation. But soon she realises, as we do too as readers, that she never fitted in this shiny luxurious life and goes back home to her friend's place to start over. Jemma is the kind of friend we would love to have in our lives. The friendship between these two is really well developed and believable and I enjoyed reading their interactions a lot. But the star of the story is Jemma's little girl, Ella. She always had something to comment on and was usually spot on. But Jemma and her family are not the only ones waiting for Lizzie in her hometown. Her neurotic mother (imagine Judy Geller from Friends), an old high school rival, her old job and an old flame are all waiting for Lizzie too. Which make her return a bit more complicated and give the story quite a lot of drama. There certainly were a couple of twists that I didn't expect at all and there was a moment when I really had no idea where the story was going to go. So good for Heidi Swain for having the ability to surprise me. The Cherry Tree Cafe is Heidi's debut and she has showed us her great potential. She certainly is one author to watch. I highly recommend The Cherry Tree Cafe to baking and crafting lovers as there are so many ideas to take from the book. I think I'll leave now to go make some bunting, Lizzie's style!